The human anterior insula is anatomically and functionally heterogeneous, containing key nodes within distributed speech–language and viscero-autonomic/social–emotional networks. The frontotemporal dementias selectively target these large-scale systems, leading to at least three distinct clinical syndromes. Examining these disorders, researchers have begun to dissect functions which rely on specific insular nodes and networks. In the behavioral variant of frontotemporal dementia, early-stage frontoinsular degeneration begets progressive “Salience Network” breakdown that leaves patients unable to model the emotional impact of their own actions or inactions. Ongoing studies seek to clarify local microcircuit- and cellular-level factors that confer selective frontoinsular vulnerability. The search for frontotemporal dementia treatments will depend on a rich understanding of insular biology and could help clarify specialized human language, social, and emotional functions. How critical is the anterior insula to our most valued social, emotional, and cognitive functions? Clinical neuroscience has begun to provide insights into this question, and no neurological disease has become more relevant than frontotemporal dementia (FTD). FTD refers to a family of clinical syndromes caused by underlying frontotemporal lobar degeneration (FTLD) pathology (reviewed in Seeley 2008). The major FTD clinical subtypes include a behavioral variant (bvFTD), semantic dementia, and progressive nonfluent aphasia (PNFA), which typically begin in the sixth decade of life. As detailed in subsequent sections and in Table 1, bvFTD is associated with dramatic changes in social–emotional processing which result from targeted medial frontal and frontoinsular degeneration. Semantic dementia presents with early disintegration of word, object, person-specific, and emotional meaning (Hodges et al. 1994; Seeley et al. 2005) followed by striking behavioral changes akin to bvFTD (Kertesz et al. 2005; Seeley et al. 2005; Snowden et al. 2001). The accompanying anatomical pattern begins in the temporal pole and amygdala before spreading to subgenual cingulate, frontoinsular, ventral striatal, and upstream posterior temporal regions (Brambati et al. 2007a). PNFA is associated with effortful, nonfluent, often agrammatic speech, at times accompanied by speech apraxia or dysarthria, and largely spares behavior. This symptom complex reflects dominant frontal operculum and dorsal anterior insula injury (Gorno-Tempini et al. 2004; Josephs et al. 2006; Nestor et al. 2003). Any of these syndromes, but most often bvFTD, may be accompanied by motor neuron disease, which truncates an already rapid and lethal disease course (Roberson et al. 2005). 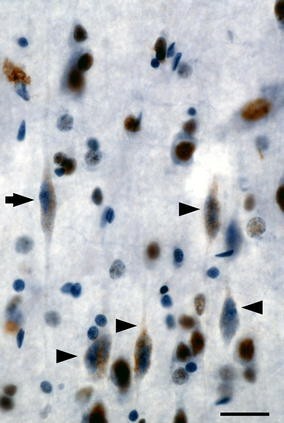 At autopsy, FTLD features synaptic degeneration, gliosis, and neuronal loss (Brun et al. 1995), with subtypes defined by neuronal and glial disease protein aggregates that may contain either tau (FTLD-tau), the TAR DNA-binding protein of 43 kDa (TDP-43, FTLD-TDP), or the newly identified FTLD disease protein, fused in sarcoma (FUS, FTLD-FUS) (Mackenzie et al. 2010). In health, tau is localized to the axon and stabilizes microtubles, facilitating axonal transport (Ebneth et al. 1998). Although both TDP-43 and FUS are nuclear DNA/RNA binding proteins, TDP-43 regulates transcription within the nucleus through its impact on exon splicing (Ayala et al. 2005), whereas FUS appears to help target-specific mRNAs to dendritic spines where they participate in activity-dependent spine remodeling (Fujii et al. 2005). Although most FTD occurs in the absence of a known genetic mutation, each FTD clinical syndrome bears a different relationship to the FTLD genetic and molecular subtypes (Table 1). It should be noted, however, that these associations remain a topic of vigorous investigation and debate (Hodges et al. 2004; Mesulam et al. 2008). Clarifying insular biology and function will accelerate FTD research, bringing patients closer to treatments and cures. At the same time, FTD-related focal degenerations provide unique lesion models for understanding the insula and carry the potential to delineate network-, layer-, and even cell type-specific contributions to insular function. These approaches could, in turn, elucidate key aspects of other common neuropsychiatric disorders, such as schizophrenia, anxiety states, autism, eating disorders, and substance abuse (to name a few) whose pathophysiologies seem embedded within the insula and its core network affiliates (Di Martino et al. 2009; Fornito et al. 2009; Naqvi and Bechara 2009; Rotge et al. 2008; Schienle et al. 2009; Uddin and Menon 2009). Understanding FTD-related insula degeneration requires a modern functional–anatomical framework. Using cytoarchitectonic approaches, the anterior insula can be divided into no less than two but more likely several distinct subregions (Mesulam and Mufson 1982a; Rose 1928; von Economo and Kosinkas 1925) (Butti and Hof 2010; Kurth et al. 2010). The two major subdivisions prove most relevant to understanding FTD. First, at the basal transition from orbitofrontal cortex to insula stretches the frontoinsular cortex [Area Frontoinsulare, or “FI” of von Economo (von Economo and Kosinkas 1925)], a ventral agranular region distinguished in humans, apes, most cetaceans, and elephants by large, conspicuous, Layer 5 bipolar neurons called von Economo neurons (VENs) also found in anterior cingulate cortex (ACC) (Allman et al. 2010) (Hakeem et al. 2009; Hof and Van der Gucht 2007; Nimchinsky et al. 1999; von Economo 1926). Second, dorsal to the major lateral convexity of the anterior insula, a dorsal dysgranular region extends toward the frontal operculum. Here, VENs quickly transition from rare to absent. More posteriorly, but anterior to the central insular sulcus, the dorsal dysgranular insula continues beneath the frontal operculum (Mesulam and Mufson 1982a). These subregions feature distinct connectivity patterns in monkeys (An et al. 1998; Mesulam and Mufson 1982b) as well as in humans, as revealed by recent functional (Taylor et al. 2009) and structural (Nanetti et al. 2009) connectivity approaches to insular parcellation (Fig. 1a). In monkeys, the ventral agranular insula connections ally preferentially with temporal pole, limbic, and brainstem regions (An et al. 1998; Mesulam and Mufson 1982b), whereas the dorsal dysgranular anterior insula bears unique axonal connections to frontal opercular and ventrolateral frontal regions. Not surprisingly, insular subregion functions reflect the distinctive connectional associations outlined above. In humans, the ventral agranular frontoinsula responds to diverse viscero–autonomic–nociceptive challenges and co-activates with the amygdala and pregenual ACC during scores of social–emotional paradigms (Fig. 1b) (Critchley 2005; Kurth et al. 2010; Mutschler et al. 2009; Singer et al. 2009). The dominant dorsal anterior insula, in contrast, activates in response to speech and language fluency tasks (Mutschler et al. 2009) and lesions in the nearby dorsal mid-insula produce speech apraxia (Ackermann and Riecker 2004; Dronkers 1996). Although functions of the non-dominant dorsal anterior insula–frontal opercular network remain uncertain, existing data suggest a possible role in response suppression and task switching and maintenance functions (Aron et al. 2004; Dosenbach et al. 2006). 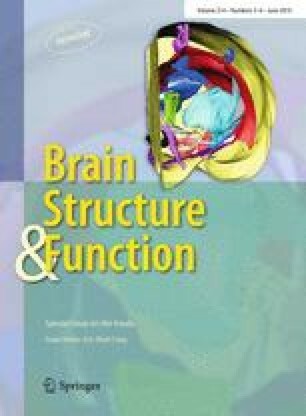 These cytoarchitectonic, connectional, and functional profiles provide a foundation for understanding FTD behavioral and language syndromes. For decades, the insula lingered in obscurity to most FTD researchers, just as it evaded the attention of many studying social, emotional, and behavioral function. But the potential significance of the insula was noted by many of the pioneer functional anatomists (Mesulam and Mufson 1982a; Mesulam and Mufson 1982b; Nauta 1971; Penfield and Faulk 1955; Rose 1928; von Economo 1926), whose writings anticipated more recent models of the anterior insula as a central hub within human emotional awareness and behavioral guidance networks (Craig 2009; Damasio 1999). Likewise, groundbreaking FTLD pathological studies by Brun and coworkers noted significant, if topologically heterogeneous involvement of the anterior insula and its paralimbic counterpart, the ACC (Brun and Gustafson 1978). Defining a comprehensive FTD topography in autopsy materials, however, proved laborious and few studies could capture early-stage disease. Based primarily on patients with bvFTD, Broe et al. (2003) clustered postmortem brains into very mild (Stage 1), mild (Stage 2), moderate (Stage 3), and severe (Stage 4) cases and found that Stage 1 showed atrophy limited to dorsomedial frontal cortex (including ACC) and posterior orbitofrontal cortex where it meets the frontoinsula. These seminal observations were reinforced by a transition from region-of-interest based volumetric neuroimaging to unbiased, whole-brain, statistical parametric mapping techniques. A host of studies came forth, using voxel-based morphometric (Boccardi et al. 2005; Rosen et al. 2002), cortical thickness (Richards et al. 2009), perfusion (Varrone et al. 2002), metabolic (Ibach et al. 2004), and neurochemical (Franceschi et al. 2005) imaging to identify anterior insula and ACC (both pre- and sub-genual parts), along with ventral striatum, medial thalamus, and frontopolar cortex, as the most consistent targets in bvFTD (Schroeter et al. 2006) and shared targets in bvFTD and SD (Rosen et al. 2002). The diversity of FTD-related insula involvement has also been newly appreciated, as researchers now more rigorously separate patients according to clinical syndrome. These studies have revealed that bvFTD involves both ventral and dorsal anterior insula by the time of early clinical presentation (Seeley et al. 2008; Fig. 3), especially on the non-dominant side. The first-affected insular subregion in bvFTD has yet to be resolved. Semantic dementia begins as a left or right temporal pole disease but spreads preferentially to ventral anterior insula (Pereira et al. 2009; Rohrer et al. 2009), whereas in PNFA the dominant dorsal anterior insula receives the brunt of the injury (Gorno-Tempini et al. 2004; Nestor et al. 2003; Rohrer et al. 2009). Moreover, anterior insula involvement stands out whether the patient’s FTD syndrome is due to underlying FTLD-tau or FTLD-TDP (Pereira et al. 2009; Whitwell et al. 2005). Efforts to use antemortem imaging to differentiate pathological FTLD from Alzheimer’s disease have also emphasized the anterior insula, ACC, and ventral striatum as the sole regions to show significantly greater MR atrophy among those later diagnosed with FTLD at autopsy (Rabinovici et al. 2007). More recently, disease-oriented neuroimaging research has moved toward more dynamic assessments of network connectivity, confirming an idea that has long been suspected: that each focal neurodegenerative syndrome targets a specific large-scale distributed network. Evidence supporting this hypothesis for FTD came from an experiment in which Seeley et al. (2009) profiled the atrophy patterns in five neurodegenerative syndromes and compared these patterns to normal networks defined in healthy controls with intrinsic connectivity network or “resting-state” fMRI and structural covariance analyses. Intrinsic connectivity networks reflect temporally coherent fMRI signal fluctuations within subjects, whereas structural covariance networks emerge from correlating regional gray matter volumes across large groups of healthy individuals. The results showed that bvFTD, semantic dementia, and PNFA each produce an atrophy pattern that mirrors a distinct healthy brain network, and these networks, in turn, feature contrasting links to the anterior insula, as described above and predicted by the known primate insular connectivity patterns. The remaining sections focus primarily on bvFTD, whose investigation seems poised to provide an unprecedented window into the anatomical underpinnings of specialized human social–emotional capacities. The full-blown bvFTD syndrome includes poor judgment, loss of initiative, deficient self-control (at times with overeating or substance abuse), compulsive rituals or stereotypies, and a profound loss of interpersonal warmth, caring, tact, and empathy (Miller et al. 1993; Snowden et al. 2001). The earliest symptoms, however, are subtle and may be mistaken for psychiatric illness or a “mid-life crisis”. One mother with preclinical bvFTD seemed unbothered when her adolescent son fled home for 3 days after an argument. A salesman could not anticipate that his client (a single mother at home with young children) would become afraid and then outraged by his repeated knocks on her door at 10:00 p.m. on a Tuesday. A third patient was hospitalized for severe dehydration after wearing a down parka outdoors on a hot summer day. Though anecdotal, these scenarios and countless others like them suggest that during incipient bvFTD the brain can no longer (1) represent the personal significance of ambient (internal or external) conditions or (2) use these representations to guide behavior. Often loved ones demand medical evaluation only after patients have been overlooked for expected promotions, lost or changed jobs, spent excessive sums on frivolities or solicitations, or have entered couples’ counseling for marital disinterest or infidelity. Encouragingly, a growing body of well-designed experiments, rooted in the modern methods of behavioral neuroscience (see below), has begun to isolate and characterize the specific social and emotional functions lost in early bvFTD, many of which remain spared in Alzheimer’s disease (Seeley et al. 2007a). BvFTD was once viewed as a diffuse frontotemporal disorder, perhaps due to the impressive but misleading textbook images of late-stage, postmortem gross brain specimens, which too often taught researchers that bvFTD destroys the entire rostral forebrain. This misconception can now be discarded thanks to overwhelming evidence that bvFTD represents a specific neural system disease (Boccardi et al. 2005; Schroeter et al. 2006; Seeley et al. 2008, 2009). In the mildest clinical phases, atrophy can be seen within the anterior insula (dorsal and ventral, especially on the right), ACC, and a network of subcortical and thalamic regions (Fig. 2) (Seeley et al. 2008). As intimated above, the atrophy pattern features remarkable spatial similarity to a large-scale distributed human brain network anchored by the right frontal insula, which Seeley et al. described using intrinsic functional connectivity mapping in healthy controls and have referred to as the “Salience Network” for its role in processing diverse homeostatically relevant internal or external stimuli (Seeley et al. 2007b, 2009). With advancing clinical severity, bvFTD atrophy spreads throughout this Salience Network and into neighboring supervisory executive-control (Fig. 2) (Brambati et al. 2007b; Seeley et al. 2008) and possibly temporopolar emotional–semantic systems in some patients (Whitwell et al. 2009a). BvFTD anatomical heterogeneity (Whitwell et al. 2009b) may help to further dissociate subsystems within this Salience Network, but this possibility has yet to be explored with network-based imaging methods. Intriguingly, Salience Network regions show striking volume loss in schizophrenia (Fornito et al. 2009), in which patients exhibit abnormal right anterior insula/ventrolateral prefrontal cortex responses to stimulus salience (Walter et al. 2009). How does the bvFTD Salience Network injury take hold? What factors “bring” the disease to this system, and where does the disease process exert its greatest effects on network connectivity? Recently, Zhou and colleagues charted Salience Network connectivity disruptions in bvFTD (Zhou et al. 2010), using the same intrinsic connectivity mapping techniques used to define this network in healthy individuals (Beckmann et al. 2005; Seeley et al. 2007b, 2009). The analysis revealed significant connectivity reductions between the overall network and its anterior insular, cingulate, striato–pallido–thalamic, limbic, and brainstem nodes (Fig. 3a), including the amygdala, periaqueductal gray, and parabrachial nucleus, a known autonomic relay between spinal cord and thalamus (Saper and Loewy 1980). Strikingly, bvFTD clinical severity correlated with connectivity disruption in only one Salience Network region: the right frontoinsula (Fig. 3b). This intimate link between right frontoinsular connectivity and disease severity may suggest that this region acts as a critical Salience Network “hub”, which, when injured, de-stabilizes network synchrony (Palop et al. 2006), disrupts network-based neurotrophic mechanisms (Salehi et al. 2003), or seeds the transneuronal spread of misfolded disease protein throughout the distributed neural system with which the right frontoinsula communicates (Frost and Diamond 2009). But a specific molecular, cellular, or microcircuit signature must exist within the Salience Network that confers selective vulnerability to this system in bvFTD. Noting the unique presence of VENs in ACC and the frontoinsula, Seeley et al. hypothesized that these specialized neurons might confer selective vulnerability due to some as yet unknown but distinctive biological feature. To test this notion, these investigators quantified left ACC VENs, correcting for neighboring neuron loss, and found VENs 69% reduced in bvFTD compared with controls (Seeley et al. 2006). Patients with Alzheimer’s disease, in contrast, showed no selective VEN vulnerability. But scant published data exist on whether and how early bvFTD targets frontoinsular VENs (Seeley et al. 2007a) or whether loss of these neurons may correlate with core bvFTD symptoms. Future studies should seek to fill these gaps, build a detailed spatiotemporal model of VEN degeneration in the context of overall bvFTD anatomical progression, and quantify relationships between neuronal vulnerability and specific subcellular pathogenic events, such as disease protein misfolding, mislocalization, hyperphosphorylation, and aggregation (Fig. 4). Furthermore, molecular-genetic and physiological studies may provide insights into which distinctive VEN biological feature confers accentuated vulnerability in bvFTD. Complex language-related functions lost in PNFA and semantic dementia have now been carefully disentangled using elegant language assessment tools, developed through decades of aphasia research on patients with vascular or other focal brain lesions. For example, consistent with a finding from the stroke literature (Dronkers 1996), patients with PNFA and apraxia of speech show focal dorsal anterior-to-middle insula/frontal opercular dysfunction (Nestor et al. 2003). Semantic dementia has provided the major disease model linking the temporal poles to domain-general semantic knowledge (Hodges et al. 2000) and has helped to reveal distinct temporal lobe subregion contributions to category-specific semantic processing (Brambati et al. 2006). Historically, the “social brain” assessment toolbox has remained much less well-developed, leaving researchers with limited means to define the functions lost in bvFTD. Exciting recent studies, however, have begun to implement controlled laboratory-based experiments and validated social neuroscientific instruments to outline the early bvFTD social–emotional deficit profile. Considering the anatomical focality of early bvFTD, we should expect that early bvFTD functional deficits might exhibit commensurate selectivity within the broad social–emotional function spectrum. Recent work by Levenson and coworkers underscores this principle and has begun to create a list of candidate functions for which the frontoinsula and its unique cellular constituents might prove critical. Most interestingly, bvFTD does not take away all autonomic and emotional functions. For example, peripheral autonomic responses to asocial stressors, such as handgrip and startle, persist in early bvFTD (Sturm et al. 2006, 2008), perhaps because these responses rely on brainstem central pattern generators (Saper 2002). Even basic autonomic and facial affective responses to emotional film stimuli endure in controlled laboratory settings despite symptoms that might seem to suggest otherwise (Werner et al. 2007). Breakdowns in emotional processing become overt, however, when the stimulus-context milieu requires self-referential social processing. So not startle itself, but the embarrassment that results from the startle response, is abolished in bvFTD (Sturm et al. 2006). Not singing karaoke, but watching one’s self singing karaoke on videotape (before an audience) reveals patients’ blunted autonomic and behavioral responses (Sturm et al. 2008). Perhaps for analogous reasons, selected patients with bvFTD have been shown to keep eating, compulsively, despite reporting satiety (Woolley et al. 2007). In this experiment, the sandwich volume patients consumed (given unrestricted access) correlated inversely with right frontoinsular and striatal volume (Fig. 5). This finding may suggest that it is not the interoceptive satiety signals themselves [which may rely on posterior insular cortex (Wang et al. 2008)] but the emotional–behavioral impact (salience) of those signals that is disrupted by right frontoinsular damage. In this way, overeating patients with bvFTD may lack the unpleasantness of feeling overly full, which no longer prevents them from picking up the next sandwich. Whether this “evaluative interoception” deficit begins as domain-specific (social salience only, for example) or more domain-general (social, olfactory–gustatory, viscero-autonomic, and nociceptive salience) remains uncertain, but careful lesion–deficit correlations in bvFTD may help to clarify how the anterior insula organizes its role in monitoring all aspects of the internal milieu. In related social neuroscience experiments from other groups, patients with bvFTD have shown profound deficits in empathy (Lough et al. 2006; Rankin et al. 2006) and interpersonal warmth (Sollberger et al. 2009), both specifically linked to right frontoinsular and temporopolar degeneration. Related capacities, including theory of mind (Eslinger et al. 2005) and social conceptual knowledge (Zahn et al. 2009) have further shown deficits in bvFTD. Mendez and colleagues have shown that bvFTD undermines emotional aspects of morality despite sparing cognitive moral reasoning (Mendez et al. 2005; Mendez and Shapira 2009), suggesting that a core unifying deficit in bvFTD may be capacity to feel or care about the social impact of one’s own behavior. Considering the unique phylogeny of the VENs (Allman et al. 2010), it is worth noting that some authors view the functions lost in bvFTD as the unique province of large-brained, highly social mammals (Dunbar and Shultz 2007; Gallup 1982). In light of this view, it seems reasonable to question whether and how VENs enhance the human Salience Network in a way that facilitates or augments social–emotional functioning in our highly social species (Seeley 2008). This review has focused on bvFTD deficits with potential links to the anterior insula. This emphasis has not been intended to suggest, however, that the anterior insula provides the modular neural instantiation of all complex social–emotional functions disrupted in bvFTD. As emphasized in previous sections, bvFTD targets a distributed large-scale Salience Network before spreading into related dorsolateral prefrontal executive-control or temporopolar emotional–semantic networks. Within the Salience Network, dynamic interactions between the frontoinsula and medial cingulofrontal, frontopolar, orbitofrontal, striatal, and other subcortical sites no doubt prove critical for the functions lost in bvFTD, and damage to any of these extra-insular regions (whatever the cause) may give rise to a subset of the same behaviors associated with frontoinsular damage. For example, right frontoinsular injury may produce disadvantageous social behaviors by degrading interoceptive guidance cues, but similar disinhibited behaviors may result from lesions to medial or lateral orbitofrontal regions (or to their striatal projection targets) if these lesions disrupt critical reward or response suppression mechanisms (Kringelbach and Rolls 2004; Rosen et al. 2005). Furthermore, faulty network–network interactions could explain important facets of the bvFTD profile, especially since one function of the right frontoinsula may be to initiate organized switching between large-scale distributed networks (Sridharan et al. 2008). 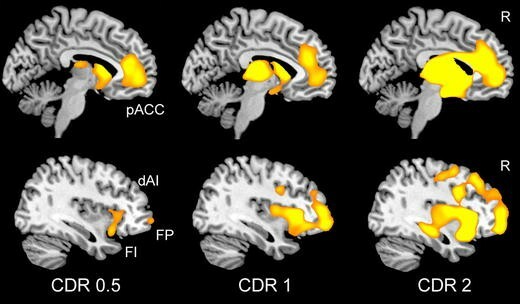 The search for FTD treatments, and even the treatments themselves, could bring new insights into the anterior insula’s role in human social–emotional processing. Until a disease-arresting therapy is identified, increasingly sophisticated human neuroimaging and postmortem studies could begin to forge links between specific networks, regions, layers, and cell types, on the one hand, and well-defined clinical deficits on the other. But the pace of discovery in basic FTD research is hastening, and one can now begin to imagine a more uplifting set of experiments. Some day, we will learn spectacular new lessons about human speech, language, and social–emotional functions by documenting our patients’ treatment-related recoveries. I thank my patients, their families, and my colleagues for their contributions to this work. Research reviewed here was supported by NIA grant numbers AG027086, AG19724, AG033017, and AG1657303; the James S. McDonnell Foundation; John Douglas French Foundation; and the Larry L. Hillblom Foundation.